When the legendary Nikola Tesla presented his World System, i.e. free energy broadcast system, to John Pierpont Morgan, the latter not only withdrew his financial support for the futuristic project, he also sent men to demolish the Tesla Magnifying Transmitter and burn his laboratory down in Wardenclyffe, Shoreham, Long Island, New York. JP Morgan believed he could not put a meter on it. He was wrong of course. Nothing could ever stop highly determined suckers from finding innovative ways to bleed everyone dry. For these madmen, the exercise of power over a great number is an opiate of extraordinary ecstasy. Today’s internet service provider could charge anyone for subscription fee. All broadcast technologies are, of course, mere byproducts of what Tesla was trying to achieve. Here in the Philippines, we have the slowest ISP speed in the world, second only to Afghanistan, and yet we have one of the most expensive. They could also control the bandwidth and meter our monthly downloads in gigabits per month. The highly anticipated hydrogen economy will be following the same scheme. The Pope’s “climate change” encyclical and subsequent UN speech about “all inclusive capitalism” signaled the start of the global implementation of free energy systems that are not entirely free of charge. In fact, the industries will be profiting hugely from it considering the operational cost of the new infrastructure is greatly reduced due to the reduction in, or complete elimination of, fossil fuel costs. In the case of carmaker Toyota, they will be building waste to energy conversion processing plants and hydrogen distribution outlets to extract and deliver hydrogen gas from your garbage. Lloyd said Toyota approached him and Fox three or four months ago to take part in the automaker’s “Fueled by Everything” series, which has showcased renewable techniques for generating hydrogen. Previous episodes have showed methods for making hydrogen out of biogas from cow manure, and by electrolyzing water or lemonade. The Mirai’s environmental credentials have been questioned by critics and Tesla Motors Inc. founder Elon Musk, who has panned the technology. While it’s true there are renewable sources of hydrogen including wind and solar power, the cheapest and most frequent method used today is to steam it out of natural gas or coal, which actually produces environmentally harmful carbon dioxide. 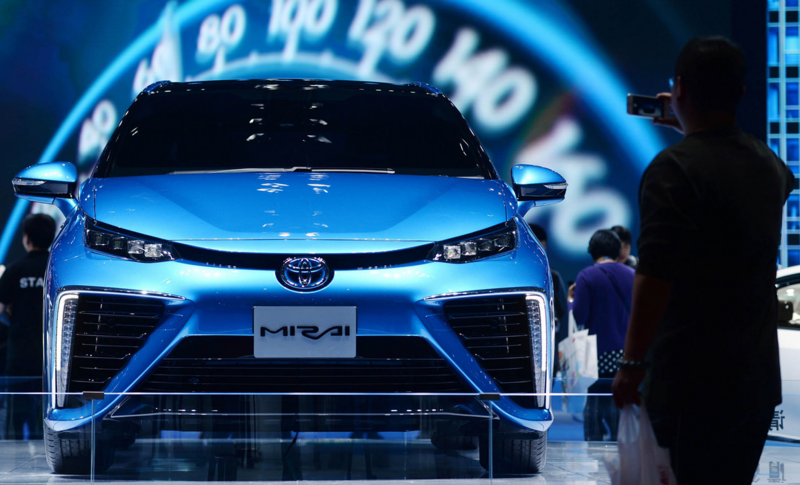 The Mirai itself uses an electric motor and generates no emissions, except for harmless water vapor. Toyota will begin U.S. sales on Oct. 21, 2015, the same day Doc and Marty travel to the future in the second installment of the Back to the Future trilogy. This is all good considering that we truly need to clean the wastelands that we’ve just buried underneath our cities. Still, why are they not saying about ordinary tap water, or sea water to which 2/3 of the planet is made of and allow the production of hydrogen on demand and on-board? Isn’t it far dangerous to store highly explosive hydrogen gas in multiple gas stations in highly populated urban centers? The idea might be to protect the planet but certainly not to protect you. In fact, the original agenda for the “climate change” hoax is to eliminate a sizable portion of the population yet preserve the planet for their own exclusive use later on. The constant instigation for thermonuclear exchange with Iran, China and Russia while they hide in fully equipped underground bunker-cities used to be their most elaborate plan. That has been thwarted already by the BRICS, and other sections of the covert Earth Alliance, through controlled detonations of suitcase nukes and the use of highly advanced sonic weapons sealing the entrances on all of these underground bunkers. All those countermeasures explain those “unscheduled” earthquakes and strange loud ambient sounds for the last four years, or so. Yes, there’s a covert multi-pronged war going on and we have followed these developments for years from the viewpoint of geopolitics and finance though our geopolitics website. Going back to 1869, Edison had patented breakthroughs in communications, movies, lighting, and power distribution. By the end of his career, he was an international celebrity with 1,084 utility patents to his name, the most for an American. That record stood until July 7, 2015, when Wood received U.S. Patent No. 9,075,906 for “Medical support system including medical equipment case,” a device that can imbue medical gear with video­conferencing and data-transmission abilities so a patient can leave a hospital and use the machines at home. It’s his 1,085th patent. Just as remarkable, Wood has more than 3,000 inventions awaiting perusal by the U.S. Patent and Trademark Office. He’ll likely remain America’s top idea man for many years to come. And what would happen if the “most prolific” inventor meets with the most “generous eugenics philanthropist”? Nope, there was no mention of Tesla either, the man who literally created the 21st Century and the assistant who taught Edison how to avoid burning the filament of his 2000th light bulb by advising the latter to evacuate all gases from the glass tube assembly before switching it on. Indeed, Science is a double bladed sword that when it falls to the wrong hands and used for all the wrong intentions, that’s the day you begin to hate it. But that should not be the case. These free energy technologies that are being released in a controlled manner so as not to cause major disruptions on the current economic system seem laudable if only that it is being done so with a planned shift to a resource-based economy as defined by Jacque Fresco. Otherwise, the profit of the energy monopolies will only fattened up and the unwarranted power of existing powercenters will only increase. The massive awakening is accelerating and they know that. But the Corporatists will always try to hold on to their power for as long as possible. It is, therefore, up to us to make sure that the transition to full free energy economic system is shortened. We can do that by taking back our governments from the Corporatists and direct all budget to the full establishment of publicly owned free energy systems, and the responsible implementation of all allied yet currently suppressed technologies. We need to remove those who try to misuse all the useful knowledge that have been discovered so far and start building a better future for the next generations to come. This is our responsibility. This should be done now. The people are ready for the big change. It seems, they still are not. Nikola Tesla’s Wardenclyffe was built in Long island, New York, not in Colorado Springs. Some of the info about Tesla in this article seems a bit mishmashed, but overall I agree with the message.